Kimpton Hotels & Restaurants is still inspired by the vision its founder Bill Kimpton had when he started the hotel development and management company 37 years ago. Located near Yorkville amidst “the Bohemian hipness of the Annex,” he says the hotel delivers luxury without the attitude, and it’s all about service, reflecting warmth, culture and joie de vivre. From the sculpted white squirrels that adorn the inside of closets (an homage to the famed critters of Trinity Bellwoods) to “the watchful eye of the Saint George owl” — a large mural on the exterior of the hotel by Toronto street artist birdO, art is integrated throughout the hotel. After six months of renovations, he says the hotel has been transformed from its former state as a Holiday Inn. Just one of the many features of the suites is that they come complete with turntables and vinyl records. Through a partnership with Sonic Boom, special guests can even receive personally engraved records suited to their musical taste ahead of a visit. Guests can also borrow bikes during their stay and all rooms are stocked with yoga mats. The property marks the company’s first foray into Toronto and is currently the only Kimpton in Canada, although the company previously operated hotels in Vancouver and Whistler, which are no longer part of the brand. Agents can earn commission on bookings. As for other Kimpton hotels, DeFrino said recent openings include Amsterdam and the Cayman Islands, and properties in Bali and Taipei are set to open in the next year or so. 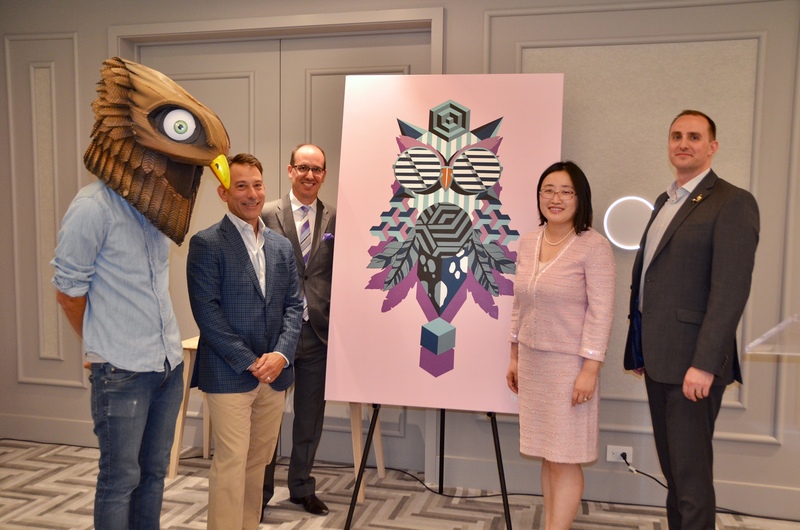 Pictured (at top) at a Toronto event yesterday are (l-r) birdO (Toronto street artist Jerry Rugg); Mike DeFrino, CEO, Kimpton Hotels & Restaurants; Andrew Weir, Executive Vice President & Chief Marketing Officer, Tourism Toronto; Lydia Chen, CEO InnVest Hotels; and Bertrand Mangeot, General Manager, Kimpton Saint George. 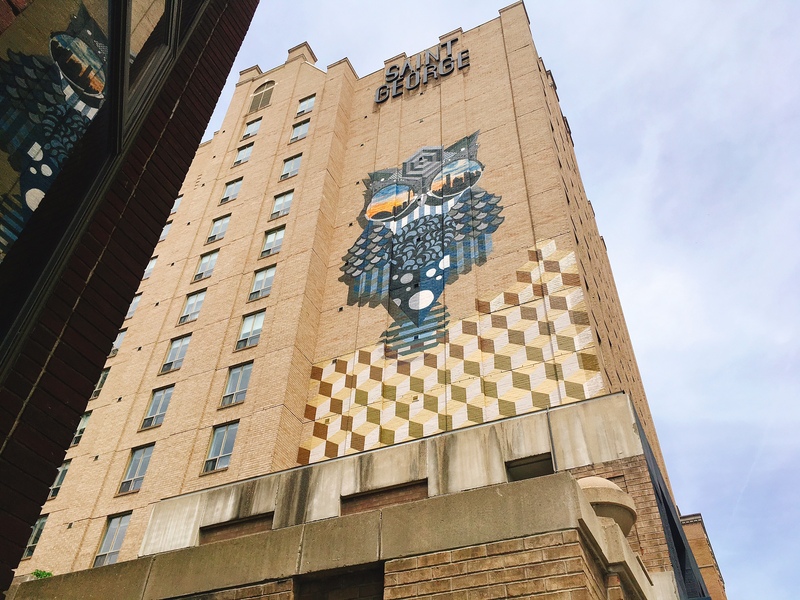 Middle: the birdO mural on the exterior of the hotel.